Knesset Legal Adviser says request to impeach MK Basel Ghattas needs to include the reasoning for the request. Efforts to impeach MK Basel Ghattas (Joint List), who is suspected of providing cellular phones to Hamas terrorists in Israeli prisons, hit a snag on Tuesday. 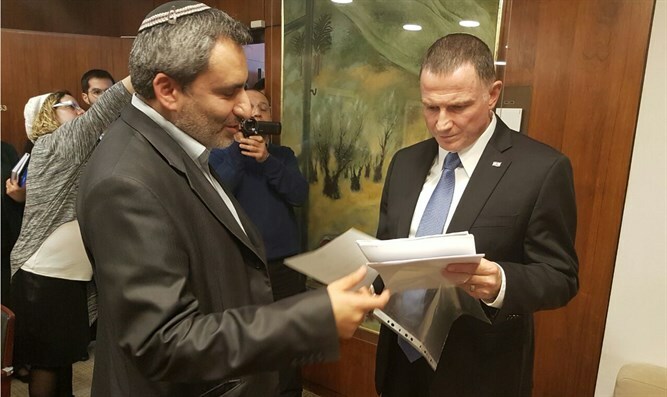 On Monday, Minister Ze'ev Elkin (Likud) submitted to Knesset Speaker Yuli Edelstein the 72 signatures from MKs required to apply the MK Removal Law in the case of Ghattas. However, Knesset Legal Adviser Eyal Yinon informed Elkin on Tuesday that his request to impeach Ghattas did not include the reasoning for the request as required by the law, and he would therefore need to resubmit the request. Responding to Yinon’s letter, Elkin indicated on Tuesday evening that the request would be resubmitted with updated information. "Since the majority of the signatures were collected before the indictment [against Ghattas] was submitted, the text of the letter to the Knesset Speaker was based only on the initial material published. In consultation with the Knesset's Legal Advisor it was decided that we would submit an updated request which will include the incriminating video and the material in the indictment draft prepared by the Attorney General, which clearly show that the actions of MK Basel Ghattas certainly constitute aid to a terrorist organization,” said Elkin. Meanwhile, Ghattas is not only alleged to be implicated in aiding terrorists in Israeli prisons. On Monday he was questioned by police on allegations of forgery, fraud, and money laundering, among other charges.